As you can see, even when all the results should be 28, when I'm calling the container as docker run --rm -it ubuntu:16.04 tput lines it always gives me 24 despite the size of my terminal. This is not only with the ubuntu container, I also tried with debian (docker run --rm -it debian tput lines) and I'm having the same result 24. The purpose of this is to use the mdp presentation tool which takes into account the lines in your terminal. When my implementation failed, I tried some other person's docker implementation but I ran to the same error. Does anyone has any idea what it could be and how can this be solved? Update Sept. 2018: check if docker 18.06 has the same issue (it should not, after moby/moby issue 33794, and also moby/moby issue 35407 and PR 37172, part of the 18.06 release notes). You could try overwrite ENTRYPOINT with bash -c and check if that works better. I will check the option of defining a custom image. There might be a synchronization issue, as the same command does return 24 from time to time. 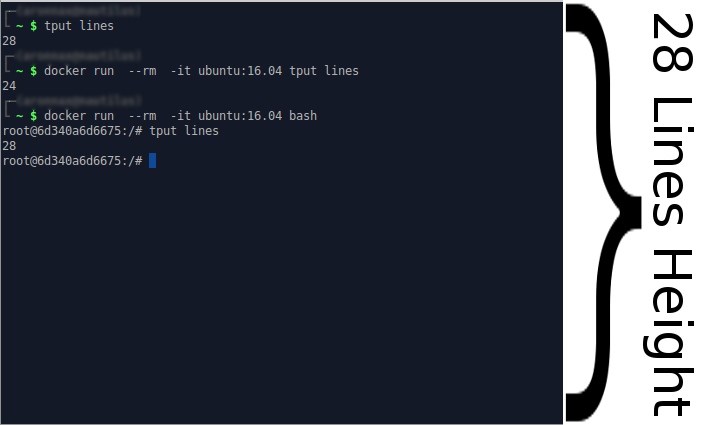 docker run --rm -it --entrypoint /bin/bash ubuntu:16.04 -c "sleep 0.1 && tput lines"
Given the success of sleep my suspicion is that docker spins up the container with the running command, and once up, the client attaches to the running container. Typically something that takes milliseconds. A tput lines within an attached session works just fine. the container is created, then started with the defaults (80x24), and after that (when -it), a session is attached. See "Resize a container TTY" API. For more, see docker issue 25450. This has actually popped up again inside the runtime-spec (opencontainers/runtime-spec PR 563). Basically, since Windows requires the ability to set the console size on first start, we might end up adding it for all platforms. // to cause things to catch up. would it make sense to use this property on Linux as well, and set the initial console size using that value? Kenfe-Mickaël Laventure (mlaventure) is on it, and a new patch could make it to Docker 1.13.
remember to source ~/.profile before using the goinside function. the LINES and COLUMNS environment variables. A command which is run without an interactive shell could be executed in a way that precludes getting the current window size. For example, that is a feature of ssh (the -t option). Also, it would be possible (though pointless) for Docker to set the LINES and COLUMNS variables. Either case (1) or (3) is enough to explain the behavior; introducing time-delays and races does not do that. Not the answer you're looking for? Browse other questions tagged bash docker terminal tput or ask your own question.